The most important criteria when selecting a feeder are that it be easy to clean and easy to fill. Feeders should come apart so that all parts are open and available for cleaning. 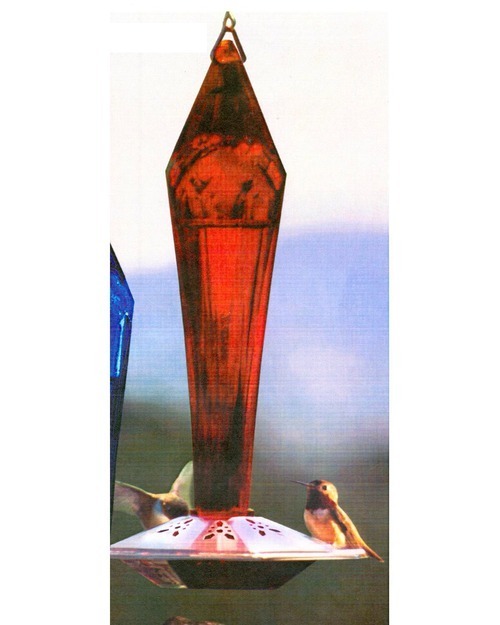 Keeping your feeder clean is paramount to the health of the hummingbirds. Hummingbirds will eat from anything with nectar in it, but they’ve gotta be able to find it. 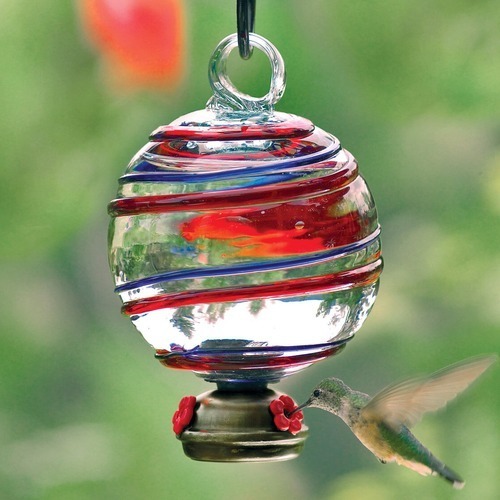 Most hummingbird feeders have red on them because the birds seem to be more attracted to red than to other colors. But, if your feeder doesn’t have red on it, don’t worry. Just tie a piece of bright red ribbon on it to attract them. They will explore around and find the nectar once they discover the feeder. Don’t use yellow though because it will attract wasps. Some feeders have perches and some don’t. Hummingbirds don’t need the perches, but they will use them if they exist and you will get to see a special treat: a hummingbird sitting still. 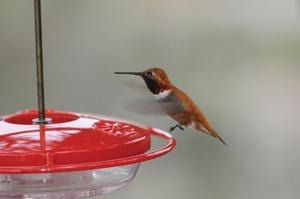 Any feeder can attract hummers, so perhaps the most important element to look for is ease of cleaning. Hummingbirds will come to any feeder that holds fresh syrup, so you might as well buy one that’s easy for you to keep up – if it’s easy, you’re more likely to do it faithfully, and that’s important. Should you buy a feeder with perches? Hummingbirds live at the edges of their energy, and perching saves a lot of calories. 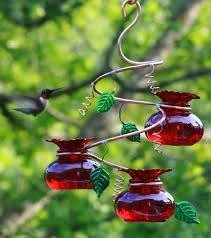 Consider that when hummingbirds feed from natural flowers, they spend very little time at any one blossom. When a hummingbird feeds from a feeder, it hovers for quite some time, and hovering is considerably more tiring to them than normal flight. Give them a break, and provide a place for them to rest by providing a perch. 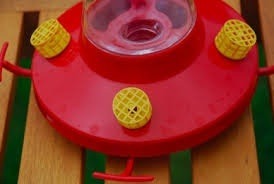 A note about pests: First, ants sometimes infest hummingbird feeders. No matter what you do, they seem to eventually be able to get to any feeder. To deter them, use an ant trap, and fill it with olive oil. This works to keep the ants from reaching the nectar. I use the ant moat pictured above with good results. Be careful though, when you’re refilling your feeder not to spill the oil onto the feeder because you don’t want it to get on the hummingbirds’ wings; second, bees and wasps also like the sweet nectar contained in the feeder. They also like the color yellow. Because many hummingbird feeders have yellow plastic “flowers” or other parts, the bees and wasps gravitate to the feeder. 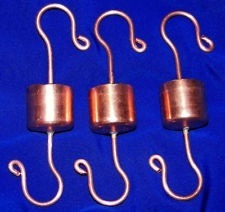 Try removing those parts before hanging your feeder to prevent bees from gathering. If possible, just avoid buying a feeder with yellow on it. Basin-type feeders are considered less insect-friendly because their design prevents the insects to get to the nectar. If in doubt, find a local bird shop. The staff are usually knowledgeable and can help you decide what feeder is best for you.